LinkedIn Marketing: An Hour a Day helps you create, customize, and optimize a presence on LinkedIn, the world's largest social network for professionals. 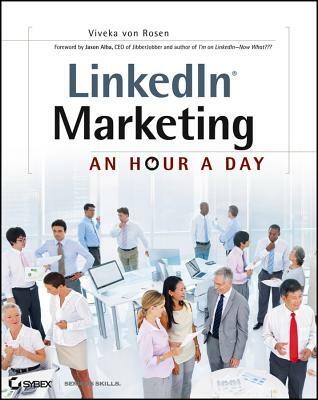 In this detailed, step-by-step book, LinkedIn expert Viveka von Rosen reveals how to use this powerful platform to ensure that you or your company get noticed by the right audience. Discover previously undocumented tips and tricks for community growth and management, including how to best use Groups, events, and other LinkedIn features and applications. This soup-to-nuts guidebook for tackling every stage of the LinkedIn process ensures your online presence will get noticed. Viveka von Rosen is known internationally as the "LinkedIn Expert" and has trained more than 10,000 business professionals on using the popular social media platform. She hosts the weekly #LinkedInChat on Twitter and is co-moderator of LinkedStrategies, the largest LinkedIn strategy group on LinkedIn. With 25,000+ first-level LinkedIn connections, she is regularly quoted in such outlets as Mashable.com, TheSocialMediaExaminer.com, and the Miami Herald. In January 2012, she was named a Top 50 Social Media Influencer by Forbes.